Military Baretta pistol plaque ( award ) [GUN-095A] - $159.95 : Metalcraft by Blair - military gifts and memoribilia. 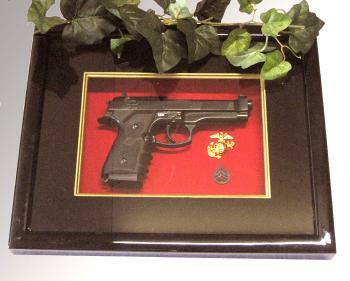 This is one of our most beautiful displays, it is a pistol of choice mounted in a shadow box with a glass cover. We have numerious pistols for you to choose from, or you can call us and tell us the gun you want..most all are available. The dimensions are 17 1/2" wide x 13 1/2" high x 1 3/4" deep, the wood finish is a very high polished black finish. The engraved name plate comes with the presentation -- you tell us what you want it to say.. This is a gift that will hang on a persons wall for years,, they will be very proud to get and display it.. I can not think of a better way to say congratualations for a job well done or good luck on your retirement..